HPDI’s new product ULTIMATE PROTECTOR™ is a next generation cell protection formula that simultaneously meets the needs for high levels of Vitamin C, full spectrum antioxidants (high ORAC values), and protective enzyme activators (Nrf2 activators from plant-based polyphenols) in a single product. This potent combination of characteristics distinguishes the formula because no other single product available today offers such complete protection. All three of the product’s components provide significant protection against the various types of free radicals that cause cellular damage in the body. In particular, the full spectrum of antioxidants derived from high ORAC fruits, vegetables, and herbs (as well as Vitamin C) provide extremely powerful exogenous sources of protection against oxidative stress. To obtain a quantitative measure of just how powerful these external sources are we have elected to conduct ORAC testing. ORAC (standing for “Oxygen Radical Absorption Capacity”) was developed by Brunswick Labs as an analytical tool for estimating the antioxidant capacity of substances. It is an in vitro test that was an important advancement in commercially available analysis of the peroxyl free-radical’s trapping ability of foods and ingredients. It has become a de facto standard in the natural products industry. However, the original ORAC method was considered to be just a starting point for comprehensive antioxidant analysis. The fact is that there are a variety of “free radicals” that operate in humans — the most important of which are the primary radicals hydroxyl, peroxyl, peroxynitrite, singlet oxygen, and superoxide anion. Brunswick Labs has reported that even though the peroxyl is the major free radical in the body, it represents no more than 27% of the total antioxidant potential of selected fruits and vegetables. In addition, the original ORAC method favors certain antioxidant substances over others (e.g., anthocyanins over carotenoids) due to the use of a single free radical source (peroxyl radical). These radicals are formed, behave, and are defended against differently. They all contribute to 1) a general condition called “oxidative stress,” or cellular damage and 2) broad human health concerns caused, for example, by inflammation, DNA and protein damage. They are each implicated in different health problems – from cardiovascular disease to macular degeneration and Alzheimer’s disease and to skin damage and aging. Below we provide a brief summary of these free radicals. The Peroxyl Radical is very important in many biological systems, including lipid peroxidation, DNA cleavage, and protein backbone modification. Hydroxyl is highly reactive and cannot be eliminated by our endogenous enzymes (such as SOD and glutathione). It can damage virtually all types of macromolecules: carbohydrates, nucleic acids, lipids, and amino acids. In the skin, hydroxyl radicals are created by UV exposure. Peroxynitrite is a reactive nitrogen species that is particularly harmful to proteins. It has been implicated in the development of certain cancers, hepatitis, and chronic inflammation. In the skin, peroxynitrite contributes to the breakdown of vital proteins, such as collagen. Singlet Oxygen is generated in the skin by by UV. In vivo, it is linked to the oxidation of LDL cholesterol and cardiovascular disease. Singlet oxygen is highly unstable and durable. Carotenoids are very effective at scavenging singlet oxygen. Superoxide Anion is a precursor of all other reactive oxygen species and sometimes is referred to as “the mother of free radicals.” It is highly toxic and contributes to lipid and DNA damage. Antioxidants that scavenge superoxide anion also help prevent the formation of radicals such as hydrogen peroxide and hydroxyl. Superoxide anion has been linked to hypertension and cardiovascular damage. Recently, Brunswick Labs has introduced a new test called ORAC5.0™ (also known as ORACFN). This test expands the ORAC platform to measure the antioxidant capacity against each of the five primary reactive oxygen species mentioned above. ORAC5.0™ substantially improves broad-spectrum antioxidant analysis and gives evidence of the diverse antioxidant potential of natural products against radicals other than just peroxyl. 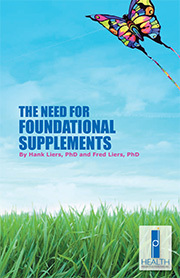 Brunswick Labs’ research shows that the antioxidants found in a wide range of natural products are effective against these primary radicals, and that in many cases a preponderance of a product’s antioxidant capacity is described by performance against the four new radicals added to the ORAC5.0™ panel. Brunswick Labs has tested ULTIMATE PROTECTOR™ using the new ORAC5.0™ tests. The results reveal an incredible overall ORAC5.0 value of 173,000 µmole TE/gram (i.e, 173,000 per gram! ), an exceptionally high ORAC value. In addition, the results show that the formula offers excellent protection against all of the five major types of free radicals. Specifically, the results show values of 6,300 (µmole TE/gram) for peroxyl radicals, 5,900 (µmole TE/gram) for hydroxyl radicals, 2,500 (µmole TE/gram) for peroxynitrite, 106,000 (µmole TE/gram) for superoxide anion, and 52,000 (µmole TE/gram) for singlet oxygen. The table (below) shows for each free radical type the ORAC5.0™ daily values for six capsules of ULTIMATE PROTECTOR™ containing 2.81 grams of the formula. The overall daily ORAC5.0™ value obtained by adding the values for each free radical type is 486,000 units (173,000 units x 2.81 g)! To the best of our knowledge there is no other product that even comes close to providing such complete protection both in terms of breadth of coverage and overall strength. 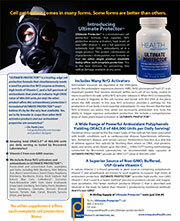 The Brunswick Labs ORAC5.0™ test results for ULTIMATE PROTECTOR™ are posted on our website. View the test results. The bottom line is that you (or anyone) can stand to benefit dramatically from an advanced antioxidant formula that provides exceedingly high ORAC values and hence amazingly high cell protection…with just a modest daily dose of six small capsules. If you are at all interested to see how well this formula can protect your heath, then we suggest you try a bottle. See for yourself how ULTIMATE PROTECTOR™ acts to provide you with the ultimate level of protection against free radicals. It’s 100% guaranteed. 17,700 Peroxyl Radical is very important in many biological systems, including lipid peroxidation, DNA cleavage, and protein backbone modification. 16,500 Hydroxyl is highly reactive and cannot be eliminated by our endogenous enzymes. It damages virtually all types of macromolecules: carbohydrates, nucleic acids, lipids, and amino acids. In the skin, hydroxyl radicals are created by UV exposure. 6,900 Peroxynitrite is a reactive nitrogen species that is particularly harmful to proteins. It has been implicated in the development of certain cancers, hepatitis, and chronic inflammation. In the skin, peroxynitrite contributes to the breakdown of vital proteins, such as collagen. 146,000 Singlet Oxygen is generated in the skin by UV exposure. It is linked to the oxidation of LDL cholesterol and cardiovascular disease. Superoxide Anion is a precursor of all other reactive oxygen species – sometimes referred to as “the mother of free radicals.” It is highly toxic and contributes to lipid and DNA damage. * Brunswick Laboratories test results for ORACFN (ORAC5.0™) for ULTIMATE PROTECTOR™ are available here. View the Brunswick Labs Ultimate Protector™ ORAC5.0™ test results (.PDF format). Ultimate Protector is now in stock!